Earlier this year, TMNT shocked us with a status quo changing injury that wasn’t really quite status quo changing after all. However, after this issue, things are going to be much different for the foreseeable future. The Turtles and Splinter have their final showdown with Shredder in a more spectacular fashion that we could have ever imagined, in large thanks to Santolouco’s beautiful art allowed to flow free in this giant-sized issue. And you couldn’t get much more final than this. 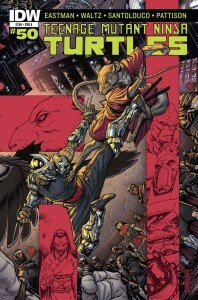 It leads the turtles, or those sticking around, into an exciting new age never seen before from the series. TMNT has been solid all the way through its start at IDW. This issue took it to new heights and we can’t wait to see what is coming next.